I finally had some time today to visit SFRAW in San Francisco. 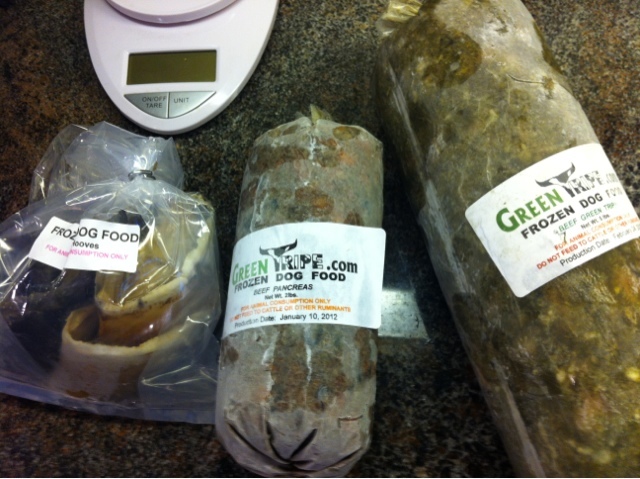 I called ahead to make sure they have green tripes in stock, so I won't be disappointed again like my last visit. I ended up getting a 5 lb green tripe roll, a 2lb beef pancreas roll, and a bag of 3 cow hooves. All three are products of greentripe.com. I paid a bit extra because I'm not a SFRAW member, but the $80 per year membership probably won't be that worthwhile for me. 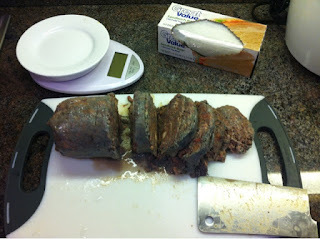 After letting the rolls thaw a bit, I sliced them up and packed in weekly serving portions. Many people complained about the smell of green tripe online, so I was prepared for something terrible. However, though not pleasant, it wasn't really that bad. Maybe because as a Chinese, I have a higher tolerance for yucky food. (People making a big deal out of cutting raw liver was just amazing to me.) The only complaint is that the smell stayed on my fingers for quite a while. 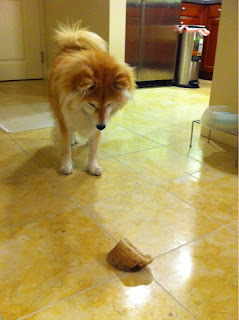 Maya poked her head in the kitchen as soon as I cut open the roll. I gave her a bit to sample, and she enjoyed eating both. They will be good additions to her current diet, as tripe is rich in manganese and zinc, which I found a bit lacking, and pancreas provides some variety for her daily organs requirements. The cow hooves actually smelled a lot worse than the tripes. I washed it a few times trying to get rid of the smell, but was in vain. Despite the bad odor, I really liked it and kind of regret I didn't get a few more bags. The texture is soft but the weird shape makes it hard to chew up too fast. At first Maya didn't know what to do with it, but once she figured it out, she fell in love right away. 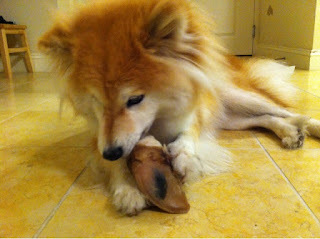 She finished about 1/4 of a hoof in about 15 minutes, then I took the rest away. I'll probably only give it to her when I need to brush her or when we need her to stay quietly in a place, like when we take her out dining with us. Do hope the smell won't bother others. Yeah the smell isn't too bad I let it thaw out tiny bit so it wasn't too mushy made it easier to portion. I need get me some tripe once I get my own freezer for don't have enough room right now.